We have all experienced it, driving down the freeway in Texas only to see an 18-wheeler struggling to keep its massive rig in a single lane. Thoughts fill your mind: what happens if this truck loses control? How can I get ahead of this 18-wheeler before the situation takes an unsafe turn? These are normal concerns. Unfortunately, massive 18-wheelers cause wrecks on our Texas roads on a regular basis, and these concerns are realized far too often. So, what do you do if you find yourself in a car wreck with an 18-wheeler? First and foremost, your physical well-being is the most important issue. These big trucks can cause severe injuries. Call 911 if you have the ability to do so. It is vital that you get checked out by medical professionals to ensure your safety. Second, call Perdue & Kidd, and our attorneys will respond to the scene of the crash. The driver of the big rig will contact his or her insurance company immediately following the crash. The insurance company will send a representative to the scene of the crash. The insurance representative is not there is ensure you get treated fairly; the insurance representative is there to ensure the insurance company will pay as little money as possible towards potential injuries and medical fees or property damage to your vehicle. Having someone present and representing your interests is important. If you do not have someone at the scene of the accident from Perdue & Kidd, remember never to give a statement to the truck driver’s insurance company. You are not required to do so, and it will only be used against you by the truck driver’s insurance company. Next, if healthy enough to do so, begin taking photographs and videos of the entire scene. Photograph the damage to your car and the truck that caused the crash. In particular, take a picture of the driver-side door of the truck. The driver-side door has important information on it, such as the truck’s Department of Transportation number. Also, be sure to get the driver’s name and the company the driver is driving for. Such pictures, videos, and information can be important pieces of evidence that can help assist you in getting maximum value for your personal injury claim. In addition to taking pictures, obtain the names and contact information for any witnesses who saw the crash. In the legal world, uninterested witnesses who have no ties to the case can be very important. Insurance companies will expend a significant amount of time and energy attempting to discredit your recollection of the events leading up to the accident. Thus, witnesses can reinforce your testimony to assist in holding the driver and company financially and legally responsible. 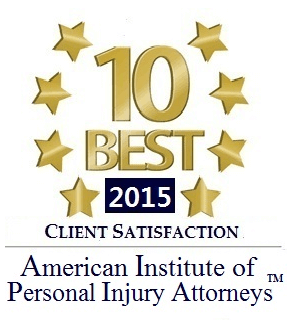 You may be wondering, who is liable for your damages–the driver or the company? The answer is both. The driver of the big rig is at fault for his or her own negligence in causing the crash (i.e., distracted driving, failure to yield, improper encroachment into another lane, etc.). However, the company for which the driver is employed is also at fault. Federal regulations impose a responsibility on the company, and the company is liable for the negligence of the driver. 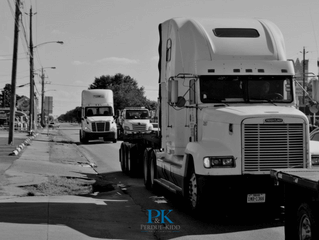 If you or someone you know has already been injured by an 18-wheeler, contact an attorney at Perdue & Kidd immediately. We are waiting to represent you in your claims against the truck driver and the trucking company.